Inflation is a term which you must often hear on the news, debates, and mostly whenever the topic of the economy comes up. Although inflation is mostly discussed in the context of cost of living, it is not just limited to that. Inflation is a term which you must often hear on the news, debates, and mostly whenever the topic of the economy comes up. Although inflation is mostly discussed in the context of cost of living, it is not just limited to that. Inflation is more like a game of dominoes, where one piece falls after another. In the same way, inflation hits every segment of economy one after the other causing a series of consequences for the common man. Overcoming inflation is more like pushing a ball uphill. The higher you get, the tougher it becomes. Thus, one has to use alternate strategies and look for better returns; else, they would end up losing out on their savings. 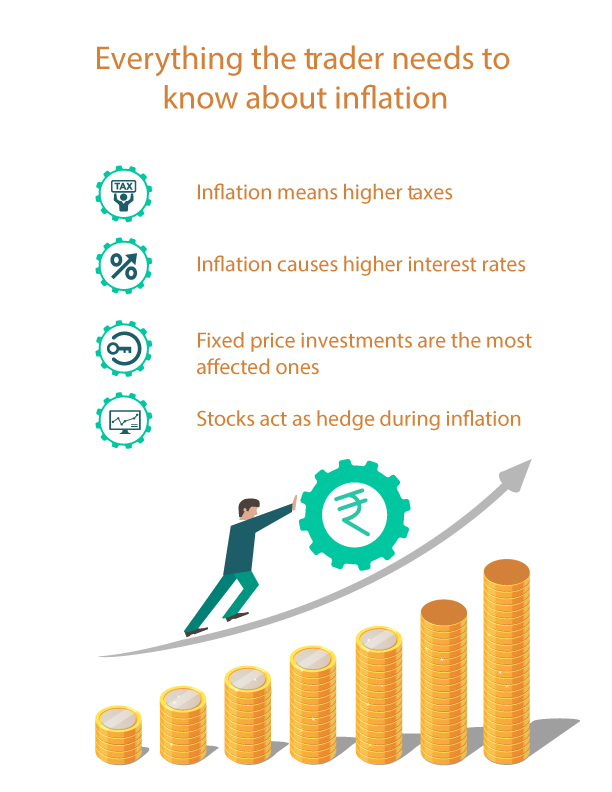 If you are a trader, then you must know these things about inflation in order to overcome it and claim optimum returns. Inflation means higher taxes: When inflation rises, a lot of things increase, and one such thing is the taxes imposed. The government, in order to increase the revenue, tends to increase taxes, thereby coping inflation at their level. This increase in taxes affects the traders, as they have reduced profit margins as a higher part is now paid as taxes. Inflation causes higher interest rates: To cope with inflation, the RBI (Reserve Bank of India) increases the rates of interests. But the catch here is that if the rates are increased for savings accounts and fixed deposits, then they are also increased on loans, credit cards (debts). This way, you end up paying more interest if you have ongoing debts. So, if you earn well on interests you end up paying even more as interests towards liabilities and expenses, and thus, a deficit gap is made. Fixed price investments remain the most affected ones: With rising inflation, the price of commodities also increases. This means that even the price of assets will increase, but that is not the case with fixed price investments. While the value of variable price investments increases with rising inflation, it remains constant for the fixed price investments. This way, fixed price investments are the most affected ones as you cannot realize the only benefit of inflation. In this manner, the deficit gap widens in the case of fixed price investments, making them the assets that are most affected by inflation. Stocks act as a hedge during inflation: As the price of everything increases, the price of final goods and services also increases. This results in better growth and higher stock prices. With growing stock prices, traders tend to earn better returns out of market trades. These profits from the stock market are high enough to overcome the price rise due to inflation. Hence, in contrary to the normal situation, stocks act as a hedge during the times of rising inflation. To minimize the ill-effects of rising inflation as a trader, you should try to minimize your debts and make a hedge of stock investments. This way, you can beat inflation in the best possible manner to accumulate wealth by not losing it to inflation.